Our annual Outreach concert on 16th June 2017 started on a sombre note, with a minute’s silence. It was two days after the Grenfell Tower fire and at least one of “our” schools, St Francis of Assisi Primary School, had been directly affected. We liaised closely with the school, and the teachers and children were keen for the performance to go ahead. So children from St Francis, as well as the seven other participating schools, came to take part and perform the songs they had practised in the build-up to the concert. We had more than 250 children on the stage of St John’s Smith Square, singing with The Bach Choir, on the theme of animals. The centrepiece was a specially commissioned work by Ian Assersohn, who had won The Bach Choir’s Composers’ Competition 2016 to set Robert Browning’s poem The Pied Piper of Hamelin to music for children’s choir, adult choir, piano, flute, double bass and percussion. The children sang their parts enthusiastically and well, especially the bits about the rats and how they were charmed by the Piper. Some of the performers and some members of the audience may have felt a little uncomfortable at the coincidence that the story was about children being led away never to be seen again: The Pied Piper is a dark story. That coincidence was unfortunate, but it takes nothing away from the quality of Ian Assersohn’s composition, which we thoroughly enjoyed learning and hope will be a valuable addition to the repertoire. The Bach Choir and the children together sang some favourite animal songs such as The Bare Necessities from The Jungle Book. The Choir on its own performed a variety of pieces, from the seventeenth-century madrigal The Silver Swan to The Teddy Bears’ Picnic. 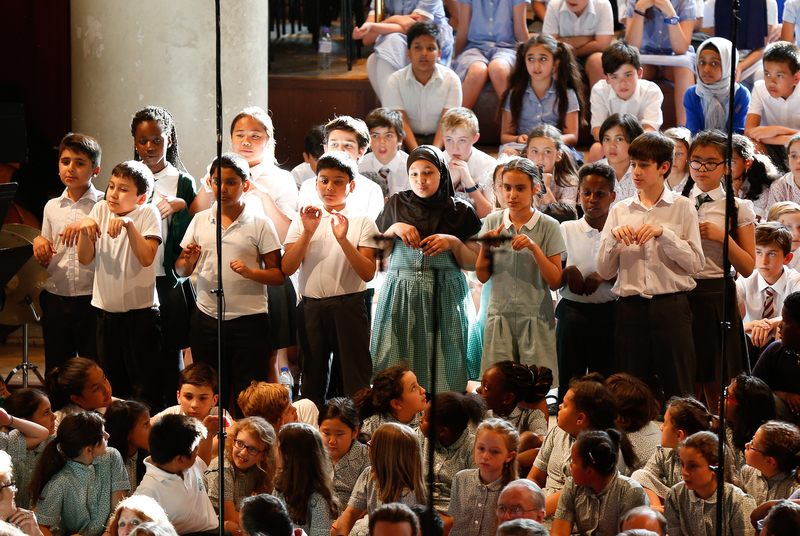 Every year we invite each school participating in our Outreach Programme to sing a song of their own choice at the summer concert. Most opt to do so and we were greatly entertained by performances of Ev’rybody wants to be a Cat, My Dog is a Good Dog, In the Jungle, Breathe the Air, Ocean Commotion and The Rockpool Rock. The audience were asked to join in The Hippopotamus Song by Flanders and Swann, which they did with gusto, and St John’s echoed with loud choruses of Mud, Mud, Glorious Mud. “I think it was all perfect”.